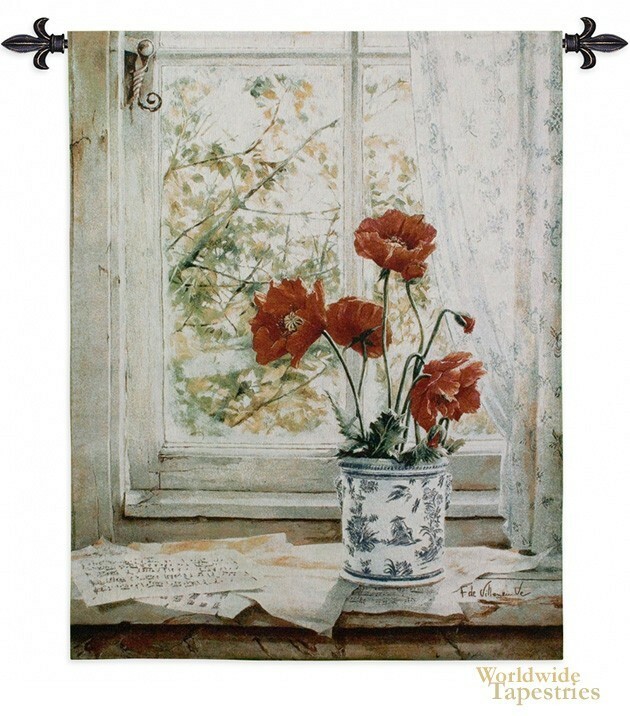 "Les Pavots" which means Poppies is portrayed here in this tapestry with great detail. The subtlety of the shadings in the petals of the red poppies are brilliantly captured. The setting is beside a countryside window with its rustic handle and panes with the wood oils showing through some of the white paint. From the work of still life artist Fabrice de Villeneuve. Les Pavots tapestry is backed with lining and has a tunnel for easy hanging. Note: Tapestry rods and tassels, where pictured, are not included in the price. Dimensions: W 42" x H 53"